Today’s post is not a DIY. It’s more of a PSA. Did you know that old hubcaps (the many decades old ones) were made of stainless steel? It’s corrosion resistant, which made for a great wheel cover – until plastic hubcaps came around in the 1970s. If you find a hubcap that is made of stainless steel then there’s a good chance it is magnetic. If a magnet will stick to the hubcap then voila! 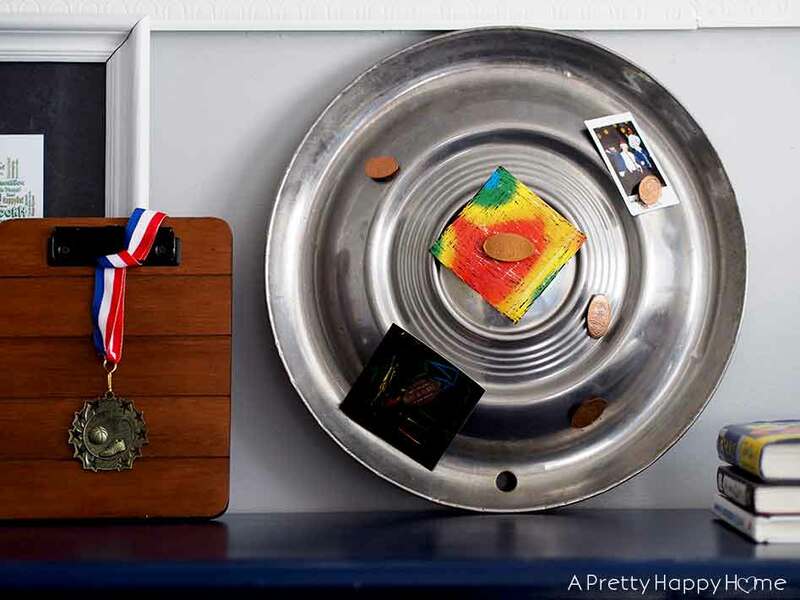 You now have a creative use for old hubcaps as a magnetic bulletin board. Are you as excited as I am right now for this discovery? I thought so. There might not be space to hold every single one of your notes and mementos on this hubcap bulletin board, but there should be room for a few of the most important ones. If you want to know what’s important to an 8-year-old boy, please reference the above photo. I own three metal hubcaps that I use as wall decor in my son’s room. Magnets attach to two of the hubcaps really well. The third one does not hold a magnet. In order for stainless steel to be magnetic, it needs to be the ferritic type of stainless steel. I’m not an expert (clearly! ), but the ferritic type of stainless steel has a high concentration of iron and its atoms are arranged in a certain way that make the metal magnetic. That’s all I know about that, so if you want an expert’s take on this topic, read this Scientific American article. On the list of things that make me happy, repurposing old items (especially ones I find on the side of the road like hubcaps) into home decor is near the top. I love the creative challenge of it. This time I managed to turn my find into something useful and I increased my scientific knowledge too. P.S. 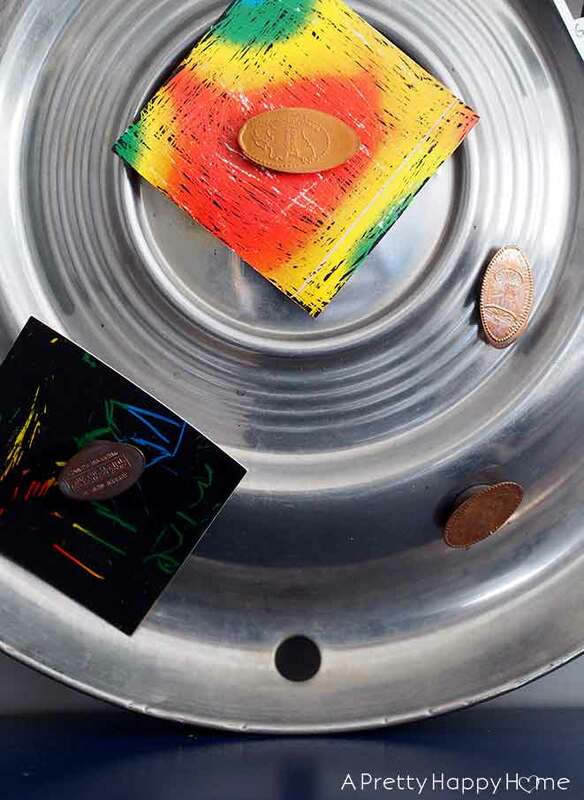 I realize most people won’t rush out to create a Magnetic Hubcap Bulletin Board. But if you do, I recommend using Command Strips to attach your hubcap to the wall. P.P.S. If you know of another creative use for old hubcaps, let me know! I’d love to see and hear how you are reusing and repurposing these and other items in your home. Thank you for your attention to this PSA. Here are some other posts you might enjoy!